EnterWorks is a master data management (MDM) and product information management (PIM) platform with solutions to help businesses drive sales and margin growth. The technology delivers compelling and differentiated experiences through a single view of content with suppliers, partners, customers, and marketplaces. With EnterWorks, users can offer differentiated customer experiences across physical and digital channels. They can also promote effective collaboration through a unified view throughout members. Companies can orchestrate complex B2B2C relationships throughout a Content Value Chain, as well as support marketing, categories and merchandising, sales and store operations, supply chain and ecommerce. EnterWorks enables integration and import using data from both internal and supplier sources. Organizations can use business rules to cleanse, normalize, and validate data. The system improves workflows by automating best practices for collaborative management of all master data. Federation and syndication tools deliver accurate, consistent, and dynamically linked product and brand content to multiple platforms. EnterWorks’ PIM capabilities boasts of a dynamic and flexible data modeling architecture to maximize productivity and drive sales. The system powers a content repository with unlimited data attributes, manages complex relationships between products and categories or hierarchies, and delivers time-phased pricing management. Administrators can assign roles for views that are customized to each user, complete with security and audit logs for accountability. Business rules can be applied to ensure the accuracy of product content, which can all be easily searched across attributes, facets, images, and text. 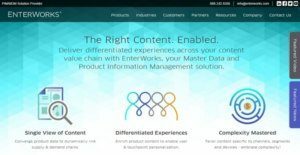 The MDM functionalities of EnterWorks protects the single source of truth for data and content so that supply and demand chains can be sure of the materials on hand. Users can customize data domains to a specific business model and assign data preferences. The system allows organizations to pick domains and integrate databases and systems. They can then extract, load, and scrub source information, before publication and syndication to external entities. EnterWorks provides dynamic data modeling by managing data as XML entities. This delivers the full benefits of open, standards-based attribute management. Users can determine and improve complex hierarchies and relationships for growing business needs. It also supports industry, geography, and customer-specific requirements while managing unlimited number of attributes and associations. Companies can develop a customized view of product content while securing product data at the attribute level, for easier PIM and MDM tasks. EnterWorks helps deploy a robust set of workflow management tools to enable, automate, and enforce best practices in data and content integration and flow across multiple sources, applications and enterprises . Users can enforce data governance, such as data quality, stewardship, taxonomy, naming conventions, and more. Organizations can manage complex business workflows related to PIM and MDM through a drag-and-drop interface for collaboration between business and technical users, or internal and external users. The flow of activities for proactive management and intervention is also graphically displayed for easy review. Syndication and Publishing features can distribute and update enriched product information to different sales channels, systems and external partners, all in real time. Digital Asset Management functions can conveniently store, categorize and manage unstructured and external content. A portal feature offers interactive and customized marketing, sales, dealer, and vendor sites for shared content development of syndication within and across enterprises. Auditing and reporting tools proactively manage content to improve workflows and business performance. If you are interested in EnterWorks it could also be a good idea to examine other subcategories of Best Product Information Management - PIM listed in our base of B2B software reviews. Since each organization has unique business requirements, it is advisable for them to desist from searching for a one-size-fits-all perfect software solution. Needless to say, it would be useless to try to find such a system even among market-leading software platforms. The clever thing to do would be to list the various essential factors that need consideration such as main features, budget, skill levels of workers, company size etc. Then, you should do your groundwork thoroughly. Read some EnterWorks reviews and look into each of the other apps in your shortlist in detail. Such in-depth groundwork can ensure you weed out ill-fitting platforms and select the app that presents all the aspects you require for business success. How Much Does EnterWorks Cost? We realize that when you make a decision to buy Product Information Management - PIM it’s important not only to see how experts evaluate it in their reviews, but also to find out if the real people and companies that buy it are actually satisfied with the product. That’s why we’ve created our behavior-based Customer Satisfaction Algorithm™ that gathers customer reviews, comments and EnterWorks reviews across a wide range of social media sites. The data is then presented in an easy to digest form showing how many people had positive and negative experience with EnterWorks. With that information at hand you should be equipped to make an informed buying decision that you won’t regret. What are EnterWorks pricing details? What integrations are available for EnterWorks? If you need more information about EnterWorks or you simply have a question let us know what you need and we’ll forward your request directly to the vendor.